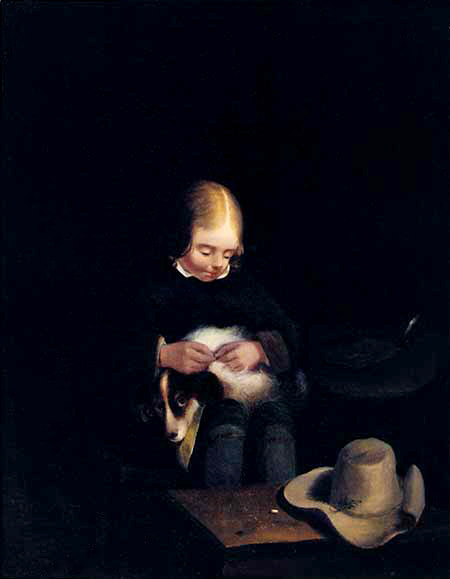 Boy with a Dog, 1831. Oil on canvas, 40 x 32 cm ( 15.7 by 12.6 in). Signed. Ranftl was one of the major painter of genre pieces from the era of the Vienna Biedermeier, primarily known for his excellent presentations of dogs, therefore he was called "Dog Raffael". Literature: Thieme-Becker, vol XXVIII, p. 67; Heinrich Fuchs, Die österreichischen Maler des 19. Jahrhunderts (Austrian painter of the 19th Century), vol 3, p. K106, fig 306 and 310; Friedrich von Boetticher, Malerwerke des 19. Jahrhunderts, vol 2 / 1, p. 354-355; G. Frodl and K.A. Schroeder, Wiener Biedermeier (Works by the artist Johann Matthias Ranftl under fig 179-183). His works can be found in the museums and galleries: Historischen Museum Wien (Historical Museum of the City of Vienna) and in the collection Österreichischen Galerie in Schloss Belvedere (Austrian Gallery Belvedere) in Vienna. We are grateful to Mrs. Mag. Sabine Grabner, Österreichische Galerie Schloss Belvedere, for the information and confirming this painting. Fine and charming painting with beautiful original frame with a hand lettered and gilded nameplate.